Tamper-proof bags offer child resistant packaging for items like medicinal marijuana, edibles, and pharmaceuticals. CRB5B is our single serve child resistant bag that measures 1 1/2" x 5" and offers a black finish to conceal your contents. 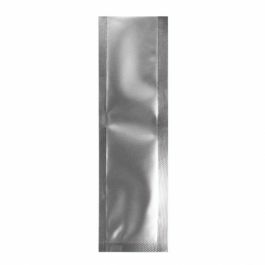 Ideal for smaller amounts, this bag has a metallized high barrier and zero smell. Heat sealable. Our CRB5B child resistant bag is an excellent choice for single use medicinal items such as cannabis flower, edibles, concentrates, herbal supplements, and small pharmaceuticals. No tear notches and a strong 5 mm seal provide extra safety measures, creating the desired tamper-proof bag. 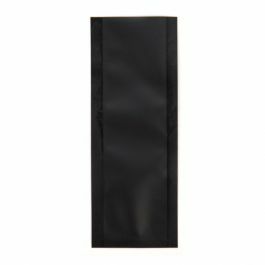 The black finish of this 1 1/2" x 5" bag offers a no-frills, plain package that won't stand out or invite further investigation from children. 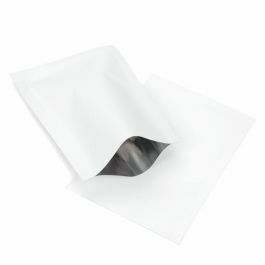 A high metallized barrier controls odors and restricts water vapor or air from entering the bag. CRB5B can be heat sealed for a tamper-resistant closure. Outer Dimensions: 1 1/2" x 5"
Certified Child Resistant in accordance with the U.S. Code of Federal Regulations Title 16, Part 1700. Conforms to ASTM D3475.